Predatory release has long been considered a potential contributor to population outbreaks of crown-of-thorns starfish (CoTS; Acanthaster spp.). This has initiated extensive searches for potentially important predators that can consume large numbers of CoTS at high rates, which are also vulnerable to over-fishing or reef degradation. Herein, we review reported predators of CoTS and assess the potential for these organisms to exert significant mortality, and thereby prevent and/or moderate CoTS outbreaks. In all, 80 species of coral reef organisms (including fishes, and motile and sessile invertebrates) are reported to predate on CoTS gametes (three species), larvae (17 species), juveniles (15 species), adults (18 species) and/or opportunistically feed on injured (10 species) or moribund (42 species) individuals within reef habitats. It is clear however, that predation on early life-history stages has been understudied, and there are likely to be many more species of reef fishes and/or sessile invertebrates that readily consume CoTS gametes and/or larvae. Given the number and diversity of coral reef species that consume Acanthaster spp., most of which (e.g., Arothron pufferfishes) are not explicitly targeted by reef-based fisheries, links between overfishing and CoTS outbreaks remain equivocal. There is also no single species that appears to have a disproportionate role in regulating CoTS populations. Rather, the collective consumption of CoTS by multiple different species and at different life-history stages is likely to suppress the local abundance of CoTS, and thereby mediate the severity of outbreaks. It is possible therefore, that general degradation of reef ecosystems and corresponding declines in biodiversity and productivity, may contribute to increasing incidence or severity of outbreaks of Acanthaster spp. However, it seems unlikely that predatory release in and of itself could account for initial onset of CoTS outbreaks. 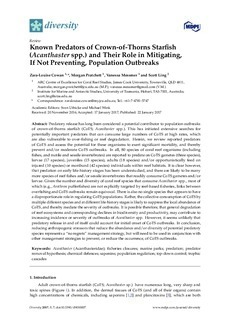 In conclusion, reducing anthropogenic stressors that reduce the abundance and/or diversity of potential predatory species represents a "no regrets" management strategy, but will need to be used in conjunction with other management strategies to prevent, or reduce the occurrence, of CoTS outbreaks.